This house at 2202 Florian fetched $50,500 in a recent Wayne County property auction. Hamtramck houses are a hot item. According to the recent Wayne County tax sale on forfeited Hamtramck houses, 22 out of 52 properties up for bid brought in almost $600,000. The 30 pieces of properties that did not receive bids will go up for auction one more time in the next few weeks. In the second round, the minimum bid will be $500 but bidders won’t have to pay back taxes owed. Most of the leftover properties are vacant lots. In the first auction, which closed this past week, bidders had to pay at least what was owed for taxes. In most cases bidding far exceeded what was owed. Only one property, at 9629 Jos. Campau, was pulled from the auction. Apparently the owner paid the $31,700 owed in delinquent taxes to avoid losing the building. 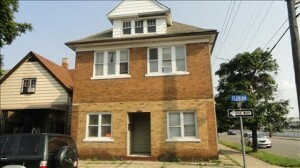 One of the highest bids went for a house at 2202 Florian for $50,500.